One level with parklike setting with lake on two sides. The perfect place to relax and enjoy warm weather and desert scenery. Shaded patio or sunny point watching the fish and many different water fowl and other birds as they winter in Arizona. Entertain comfortably with a spacious kitchen and family area, but come morning, enjoy a cup of coffee or tea on the point as the sun rises. At night, you will enjoy the comforts of the master suite and truly feel relaxed at the end of the day. To provide privacy for your house guests, the two room casita with bath is accessed through the front courtyard. This home will feel like your own private resort. We live in Seattle, Washington most of the year. Our children and grandchildren come and visit when we are in Arizona. Our garage is filled with bicycles and sports equipment for everyone. 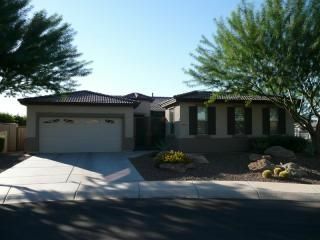 We love our home in Ventana Lakes! Mornings on the patio by the lake watching the fish, ducks, quail and hummingbirds. Idyllic. Enjoy walking around the lake on the flat pathways, or riding our bikes through the neighborhood. No traffic and easy access to stores, activities and restaurants. Enjoy the ducks, geese and many other birds that live near the lake. Catch and release fishing from the patio. Cool breezes for eating outside or just reading a book. Everything included for your stay. Gourmet kitchen that is open to the main room. Perfect for entertaining or enjoying company while cooking. One everyday dining area and one formal dining room table. A double kayak is ready for your use. Courts for tennis, pickle ball and boche ball along with shuffle board. Several golf courses are within five miles of our home. Ventana Lakes is a 55 plus community. However, any age can be guests during your stay. Four community pools. One designated for children as well as adults. Three specifically reserved for adults. Community hot tubs at pools. Our home was built in 2004 and furnished by Ethan Allen and Robb & Stuckey, we decorated our home in resort casual. Upgraded kitchen, flooring, lighting and window treatments. The master bedroom and bath are very appealing with large shuttered windows opening to the lake. The open style kitchen living area include a formal dining room (seats 10) and a more casual table that seats eight. The living area opens to a covered patio overlooking the lake and adjoins the 'pointe' patio where you can dine, enjoy the gas fire pit, fish or kayak. The patio is sheltered by large Palo Verde trees and Sonoran landscape. Barbecue and herb garden are on the side of the house. In the courtyard is a furnished casita with full bath for your guests. High speed and wireless internet provided along with 60" HDTV (includes cable). Bedding, towels, dishes, cooking needs, two car garage, water filtration system and second refrigerator freezer in the garage. For exercise, we have two bicycles with helmets, a kayak, tennis rackets and you can enjoy the sidewalk that meanders around the eight lakes in our neighborhood. There is no swimming in our lake but we have four pools in Ventana Lakes for you to enjoy. Tennis courts, workout equipment and many organized activities provided by the association. Check out the Ventana Lakes website for pictures, facilities and activities available. Nearby is Lake Pleasant for boating or hiking, Peoria and Surprise sports complexes are ten minutes away for baseball spring training and several golf courses within ten minutes including Coyote Lakes which is two miles away. Plenty of shopping centers and malls closeby. Eight minutes to the 101 Loop highway provides access to all of the Phoenix valley. We have enjoyed the Musical Instrument Museum (MIM) and Desert Botanical Garden. Two must see attractions.